Harry Kroto and Bill Lauritzen (right) pose at a conference on carbon 60. (1994) Dr. Kroto, co-discoverer of carbon 60, won the Nobel Prize for his discovery two years later. Kroto invited Lauritzen to the conference to present some of his models of carbon-60 (in photo). Martin Gardner and Bill Lauritzen (left) pose at Gardner's home in North Carolina. Gardner is the former mathematics editor of Scientific American and has written about 75 books, many of them having to do with mathematics and science. He read and praised several of Lauritzen's articles. Mamikon and Lauritzen in front of the Project Mathematics office near Cal Tech. Mamokin developed a method of doing many standard calculus problems without the use of formulas or even knowledge of calculus. Mamikon was featured in the Cal Tech magazine, Engineering and Science, and recently won an award from the American Mathematical Society. Mamikon now has a visual calculus website. 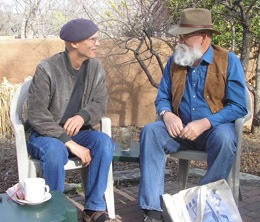 Bill with Daniel Dennett, American philosopher and author, March 31st, 2010 in Santa Fe, discussing science and religion. Bill with friend Ben Goertzel at the Brain-Like Intelligent Systems Lab at Xiamen University, China during 2010-2012. William Lauritzen is a distinguished graduate of the Air Force Academy in Colorado Springs. His first two years at the Academy, besides the extensive military and physical training, he studied algebra and trigonometry, analytic geometry, calculus, engineering, law, astronomy, philosophy, ethics, comparative religion, astrodynamics, electrical engineering, chemistry, aeronautical engineering, psychology, anthropology, history, Russian, US history, world history, military history, air power and 20th century warfare, statistics, mechanics, biology, human physiology, political science, physics, space flight, economics, and art. His second two years at the Academy he received a B.S. in psychology by studying general psychology, leadership, physiological psychology, statistics, social psychology, abnormal psychology, experimental psychology, personality, testing and measurements, learning, systems of psychology, industrial psychology, perception, and engineering psychology. He also studied philosophy, ethics, the great religions, the philosophy of science, and the philosophy of the counter-culture. He graduated near the top 1% of his class and was named "The Outstanding Graduate" in both psychology and philosophy. The Air Force then sent him to an accelerated program to get a master’s degree in industrial and organizational psychology at Purdue. At the age of 22, he received a master's degree in Industrial Psychology from Purdue, specializing in Human Engineering Design. He was assigned to design and evaluate cockpits for jet aircraft, which he did for two years. From 1980-1982 he independently studied organizations, job morale, and industrial productivity. He has been influenced in his thought and designs by Socrates, Plato, Galileo, Darwin, Freud, Buckminster Fuller, Albert Einstein, Frank Lloyd Wright, Alfred Korzybski, and others. 2004 Open Water Swim, Playa del Rey, 1st Place in age group. 1991 Hapuna Roughwater Swim, Hawaii, 1st Place in age group. 1990 Featured on KCET, with Huell Howser; for inventing a new swimming stroke. 1988 Ranked by Swim Magazine in All-Time-Top-10 World Ranking, Two Events. 1973 NCAA Post Graduate Scholarship Award, Swimming. 1972 1973, Swim Team Captain US Air Force Academy. 1968 Illinois State Champion, 100 yard breaststroke. 1968 Ft. Lauderdale Holiday Training with Dr. James Counsilman, author Science of Swimming. 1967, 1968, 1969: High School All-American, Hinsdale High School. "Nature's Numbers," booklet, Grassroots Press, Glendale, CA, 1994. "Numbers of the Future," 30 minute video, 1995. "Buckminsterfullerene Triangulated," First International Interdisciplinary Buckminsterfullerene Conference, Santa Barbara, 1993. "In the Sky Dome: Feel the Round Earth", Dome, Winter, 1995. "Versatile Economics," Dome, Spring, 1996. "Geodesic Dome Education," Dome, Fall, 1996. "Move Over Primes--Versatiles Are Here," Communicator, California Mathematics Council, September, 1996. "The Math Debate,” Glendale News Press, Spring, 1999. "The New American Education: Drill and Kill," Glendale News Press, Aug, 2000. “The Mis-Education of America,” Whole Life Times, Jan 2000. “Most Students Can’t Identify Nouns,” Glendale News Press, Nov 9th, 2000. “Is Your Kid Reading or Word Calling?” Glendale News Press, Dec 7th, 2000. “Closed-Captioned Programs Can Help Improve Literacy,” Glendale News Press, Dec 25th, 2000. Speaker, Ironwood Branch Library, Phoenix, AZ, “Atlantis and Ancient Egypt: A Scientific Explanation,” June, 2001. Guest Speaker: Los Angeles Mathematics Teachers Conference, “Geodesic Dome Education”, April, 2000. Presented paper, “Buckminsterfullenes Triangulated,” at First International Interdisciplinary Buckminsterfullerene Conference, Santa Barbara, 1993. Speaker: Air Force Test Pilot School, Outstanding Graduate in Behavioral Sciences, USAF Academy, 1973. Outstanding Graduate in Philosophy, USAF Academy, 1973. Harvard Book Award, Hinsdale High School, 1968. NCAA Postgraduate Scholarship Award, 1973.